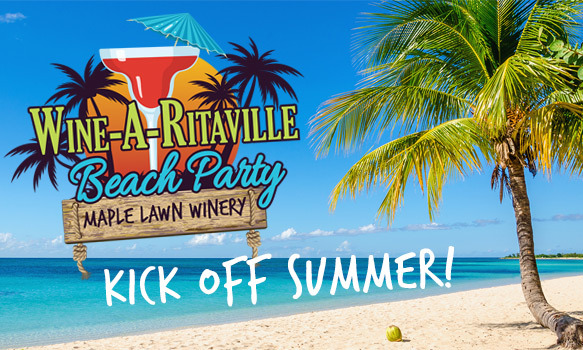 Maple Lawn Winery is trilled to announce Wine-a-Ritaville! Kick-off Summer with your friends at Wine-a-Ritaville. Waste away with us! Enjoy our specialty drinks with your crew. Our exclusive Wine-a-Ritas are mixed from our very own fruit wines. Also available local beer and even try spirits from our local favorite, Old Republic Distillery in York, PA. In the Sand & Band Tent enjoy LIVE music from Latitude 24, a Jimmy Buffet tribute band, with your toes in a REAL sand beach we’re pouring in for the event. Tickets go on sale April 1st!! Follow this Event for all details and link to tickets! Bring a chair and relax or party whichever you would like! We can’t wait for this beach party to launch summer 2019! *21yrs and older event ONLY. ID’s checked at Event. No outside food or drink permitted. NO Pets. Rain or Shine. No Refunds. A NEW, exclusive, after hours event at Maize Quest. We’re closing the corn maze and Fun Park for ONE evening this season to host wine tastings INSIDE the maze pathways!You and your friends explore a “scaled down” version of the Maze and to find wine tasting stations from Maple Lawn Winery, Naylor’s Winery and Allegro Vineyards. Each ticket includes a Campfire Cookout with bratwurst or hot dog you can cook at our campfire pits under the stars, plus roasted corn and baked potato at the pavilion. Plus, enjoy a glass of your favorite wine from the cash bar as you enjoy music. Just $28 per person – A great date night!